The Gaia Effect is a hopeful dystopian novel, set two hundred years in our future. You can download and read the first chapter for free. Watch the book trailer to get a feel for the book, you can also watch me reading the second chapter. The second book in the series is The Gaia Project. The Gaia Effect is not my normal kind of reading, but a thoroughly enjoyable read, nonetheless. Set in a dystopian future where the surviving population live in domed cities protecting them from the radiation outside, a company called Corporation exists to provide the people with everything they desire. Arguably the most important contribution from Corporation is providing a population made sterile by the radiation in the water with lab-grown babies (Corporation provides the people with clean water too). The creativity Buss shows in this regard is brilliant, and terrifying at the same time - a sort of modern day Brave New World. Now, no business likes competition. Corporation are no different. 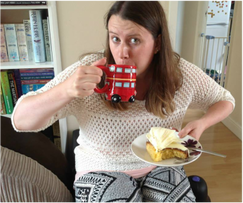 So, when three friends all become pregnant by natural means, they are in immediate danger. When the friends begin to speak together of their fears and wonder how this natural conception occurred when everyone is supposed to be sterile, they discover all of them have recently seen a vision of a shimmering blue lady. Once the identity of this blue lady is confirmed, it becomes clear something is happening far more profound than any of them realise. 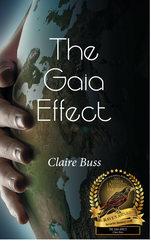 The Gaia Effect is Buss’ first novel, and speaks of the ancient and the modern, what it is to be dependent upon an overarching, largely anonymous, overseer, and, most of all, what it is to be a woman. The novel chimes with many modern day concerns, and is, I believe, a fascinating debut from an author to look out for in the years to come. (c) CB Visions, Claire Buss, The Gaia Effect and other works 2016 - present date.